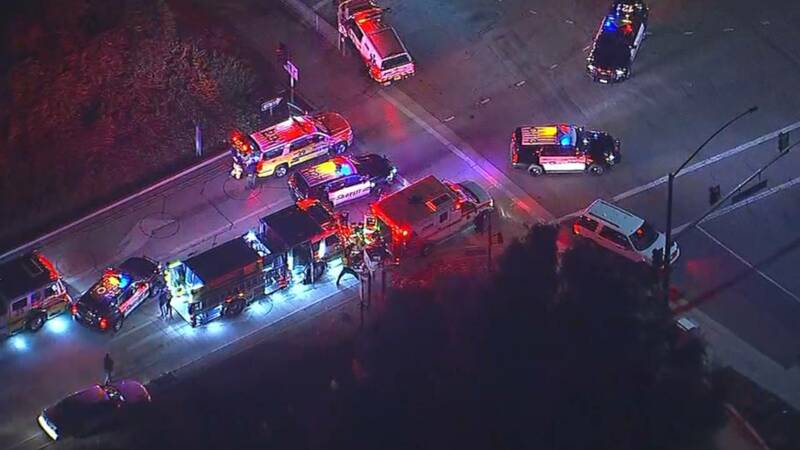 THOUSAND OAKS, Calif. - Using a smoke bomb and a handgun, a hooded gunman dressed all in black opened fire during "college night" at a country music bar in Southern California, killing 12 people and sending hundreds fleeing in terror, authorities said Thursday. The gunman then apparently killed himself. "I dropped to the floor," Sarah Rose DeSon told ABC's "Good Morning America." "A friend yelled, `Everybody down!' We were hiding behind tables trying to keep ourselves covered." "There's no doubt that they saved lives by going in there and engaging with the suspect," said Dean, who was set to retire on Friday. He praised the slain officer -- a close friend -- as a hero: "He went in there to save people and paid the ultimate price." "I tried to get as many people to cover as I could," Knapp said. "There was an exit right next to me, so I went through that. That exit leads to a patio where people smoke. People out there didn't really know what was going on. There's a fence right there so I said, `Everyone get over the fence as quickly as you can,' and I followed them over." "I screamed to him, `There's a shooter in there!' He was kind of in disbelief, then saw that I was serious," Knapp said. He said he had friends who hadn't been accounted for.